Volcanoes provide an interesting opportunity for teachers to blend several subjects together including earth science, chemistry and art. 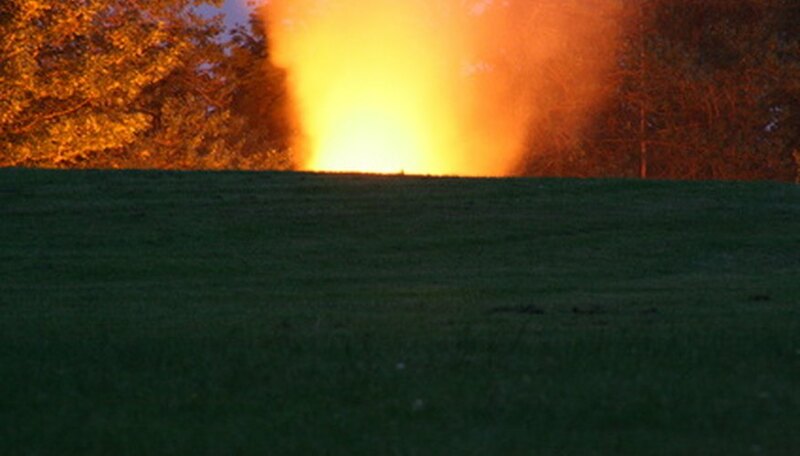 Volcanoes are one of those subjects that tend to fascinate many children. Students can adapt their interest on volcanoes into a variety of art-based projects. Many of these projects are suitable for multiple elementary school age groups. Older students will require less teacher supervision while younger students may need help to complete the projects. For pre-school students, a volcano felt puzzle is an ideal project where older siblings and parents can help. Shoe boxes, craft felt, craft paint, paintbrushes, brown flannel, red flannel, orange flannel and scissors are required materials. For each student, wrap a standard shoe box lid in felt, any solid color felt will work well. Allow the students to paint the bottom of the box with non-toxic craft paint. Students can use their creativity to paint the box, or paint it the same color as the felt. Set the box bottoms aside to dry. On the brown flannel, draw a large triangle to represent the volcano's mountain. Divide the triangle into three or four pieces. Draw thin rectangles on the red and orange pieces of flannel to represent the lava. Repeat this process for each student. Using scissors, allow the students to cut out their shapes, providing supervision and assistance as needed. Put the felt covered box lid on the dry, painted box. Encourage students to use their flannel pieces to build their volcano. The flannel fabric will easily stick to the felt, according to the "Making Puzzles" article published by Iowa State University. Puzzle pieces store easily inside the painted box. The classic baking soda and vinegar exploding volcano is an excellent way to introduce young students to basic chemistry as well as being a fun classroom art project. For this project, gather a 2-liter soda bottle, modeling clay, a plastic funnel, baking soda, liquid dish detergent, red food coloring, glitter and white vinegar, recommends the Enchanted Learning website. A disposable pie pan and glue are also recommended. Cover the work surface with plastic tablecloths and newspapers. Begin by gluing a 2-liter soda bottle to the middle of a pie pan, so the bottle is standing upright. Give students pieces of clay and encourage them to roll the clay in their hands to resemble rocks. One at a time, allow students to come up and stick the clay to the bottle to create the volcano. Allow some students to smooth the pieces of clay rock together, to resemble a mountain. Cover all of the volcano bottle, except for the opening, to allow liquid to be poured inside. After students have decorated the volcano, place funnel in the bottle's opening. Pour in 4 tablespoons of baking soda into the funnel. Squeeze in about 10 drops of liquid dish detergent. Pour in 1/2 cup of water followed by 2 tablespoons of glitter. Add in 10 drops of red food coloring. Explain to the kids that all of these ingredients make the volcano's lava. Have kids come sit in a circle around the volcano table before adding the final ingredient. Keep students about one to two feet away from the table on all sides. Add in 1/2 cup of white vinegar and watch the explosion. Sand painting is an ancient art form used by Native Americans to create paintings. Sand painting is also an excellent way for younger students, especially those in grades one and two, to play with texture in art class. Volcanoes, being made from textured substances such as rock and ash, are an ideal subject for playing with texture. For this project gather powered tempura paint, plastic containers, playground sand, paper, glue, popsicle sticks and plastic spoons, recommends the Kinder Art website. Have each student draw a picture of a simple volcano on the paper. Mix together sand and powdered paint, putting each color in a separate container. Fill a small, food container such as the ones used for spreadable butter 3/4 full of sand. Add two to three spoonfuls of powdered paint. Small groups of students can share the sand paints. Each group of three or four students should have containers of black, brown, blue, red, orange and yellow paints.Place glue on the paper and smooth it out with a popsicle stick. Be sure to cover all areas that will be "painted" with glue. Use a spoon to shake the appropriate colored sand paint over the area. Shake off any excess sand. When the paintings are complete, spray with hair spray to help the sand adhere better to the paper. As students begin to get older, a clay volcano eruption and felt puzzle will probably not be satisfying. For older elementary school students, those in grade three through five, help them create a volcano storyboard followed by a flip book project, recommends the University of Alaska Fairbanks. Give each student a large piece of paper divided into five equal sections. Give a presentation about the five stages of volcano growth to the classroom. Encourage students to draw the five stages in each of the panels, starting with the first and progressing to the last. Explain to the students that this paneled drawing is known as a storyboard and is often used by filmmakers and television directors to visualize the story. Next, pass out two squares of card stock, five squares of construction paper, a hole punch and yarn to each student. Have the student recreate their drawings, one on each piece of paper. Be sure to keep the drawings roughly the same size. Stack the papers in order so stage one is on top and stage five is on the bottom. Place a piece of card stock on the top and one on the bottom. Punch two holes through the papers on the left hand side. Thread yard through and tie in a knot at the back. Flip through the pages rapidly and watch what happens.